This is the second s’mores-style dessert I’ve written about, which is strange because I’m honestly not that impressed by s’mores. The first one I wrote about here and they’re delicious and cute for parties. 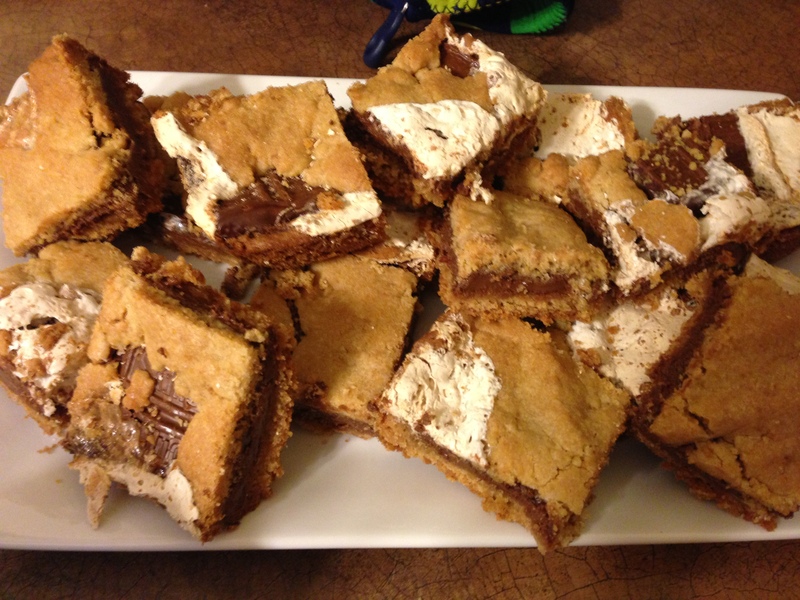 These s’mores bars are more rustic (to use a term Barefoot Contessa loves) and very easy to make. I found the recipe for these via Pinterest at The Apron Gal’s blog. I had a little mishap in doubling the recipe last time and wound up with not nearly enough dough to make the top layer, so I did the fluff layer before the Hershey bar layer, and I flattened little pancakes of dough and scattered them over the top. As you can see from the picture, there are big pieces of exposed chocolate and marshmallow, but I actually think I like that better than a smooth layer of dough. Hooray for happy accidents! To save a little time, you can buy graham cracker crumbs already made in the baking aisle by cake mixes. The dough for this is very sticky – wet your hands with cold water before trying to spread it in the pan. Then the dough won’t stick to your hands as much. Really grease the pan and try to leave a border of dough without marshmallow fluff. When the marshmallow gets on the side of the pan, it hardens and is tough to get out. Definitely stick with Hershey bars and don’t try to jazz these up with fancy chocolate. The distinct taste that a Hershey bar has is what makes these taste like s’mores. Mike said these were delicious when you brought them to school!